Last night I had the pleasure of welcoming Seth Taylor, Executive Director of the NoHo BID, as a guest speaker to my Downtown Economic Development class (which is offered through the Department of City and Regional Planning at Pratt Institute in Brooklyn). 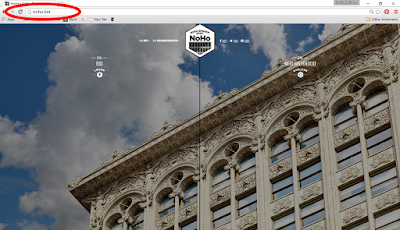 Seth spoke about his organization’s efforts to rebrand and reposition the area known as NoHo – for North of Houston Street in lower Manhattan. If you are more familiar with SoHo, well this is its northern cousin. After issuing an RFP for a design firm to help develop a new brand, logo and website, the BID settled on Box Creative, a SoHo-based graphic design firm. The new logo was evocative of the great architecture and high-end design aesthetic increasingly found among the district’s businesses. Another exciting element of the branding effort was the website. The brothers who run Box Creative suggested to Seth that he consider a .BID domain to maintain consistent branding across all platforms. Seth didn’t realize that you could select a .BID domain over a .COM domain – and neither did I! He explained to the class that the .BID domain was developed for auction sites, but of course works perfectly for Business Improvement Districts. He went with NoHo.BID as his website address and never looked back. The domain name is streamlined and clean, just like his newly designed logo and website. Take a look! I thought this was too good not to share. With 2,500+ BIDs across the country, this is an idea whose time might have come!